In this tutorial, I am going to talk about what meshes are, why you might want to use them, and how to use them in Codea. To complete this tutorial, you probably want to have a basic understanding of Codea and the LUA language. Let's call the level of difficulty "intermediate." First off, let's talk about what a mesh is. You might think of a mesh as a 3D object, and meshes ARE a basic part of 3D objects. But a mesh could more accurately be defined as as a list of polygons, and more specifically, in the case of Codea, it is a list of triangles. These lists of polygons are very useful for both 2d and 3d game creation. Basically any 2d or 3d shape can be broken up into a bunch of triangles. Generally, the more polygons used, the smoother the shape. In modern 3d games, the models are composed of thousands (or tens of thousands) of polygons. To accomplish this feat, the iPad graphics hardware has been designed to manipulate and draw triangles extremely fast, much faster than just drawing pixels to the screen. By using meshes in Codea rather than using the sprite command, you can often drastically speed up the rendering in your game. To create a mesh you simply run the built in mesh function, which returns an empty mesh. Run this and you will see our grey triangle appear in the bottom left hand corner of the screen at the origin. 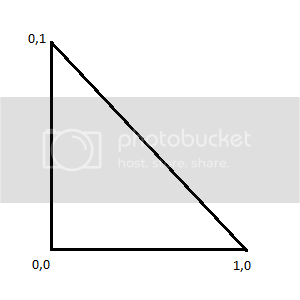 The triangle is rendered in grey because we have not given it any color or texture. Let's try giving it color first, and we will graduate to textures later. Now our mesh is rendered in color, and we get a pretty neat gradient effect as the colors are blended between the vertices. You can use this technique to create gradient backgrounds, buttons, etc. 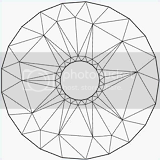 And Voila, we have our image drawn correctly to a mesh. Now that we have learned how to draw a rectangular texture onto a mesh the hard way, lets look at a slightly simplified way of completing that same task. Much easier, huh? The reason we used 50,50 there instead of 0,0 is because the addRect function creates the mesh CENTERED on the x,y coordinate given. 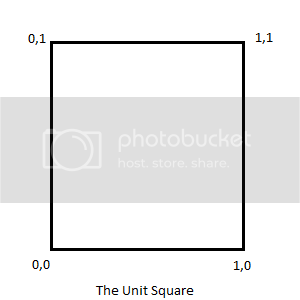 When creating rectangular meshes, it is generally much easier to use the rectangle functions. If you are just using meshes to draw sprites quickly on the screen, then using addRect will likely be much more user-friendly than creating a list of vertices and creating a complimentary texture coordinate list. In a future tutorial I will cover moving meshes into 3d and using indexed colors. If there are other topics concerning meshes you would like me to explain, please let me know. One more important thing about addRect and other rect functionalities: addRect is just a short way to add 6 vertex (so 2 triangles). Last thing: you can't remove vertices from a mesh, if you really need that, the only way is to clear and set a new vertex buffer. Brilliant - fantastic tutorial @Vega. You can set a uniform colour all in one go. Order matters - experiment to be sure, but I think the texture has to be set before the texture coords, and a global colour only affects previously declared coords. You can set colours and textures, in which case the colours tint the texture. Edit: I've added links to the WIki and Issue Tracker at the top of the forums. Hopefully they will be more accessed now. Amazing post, @Vega. Thank you for sharing what you learned. I second adding it to the wiki. You can't remove vertices from a mesh, but you can effectively remove triangles by collapsing their vertices — they will still be "in" the mesh, but won't be rendered. If you plan to add and remove a lot of triangles (for example, in a particle system), it's best to allocate a whole bunch of vertices and then arrange them into triangles when you need them, and collapse them when you don't. Thank you for the feedback. I will add a few things and revise a bit and post it to the wiki. I will continue spelling it color, however, as I am from USA. Sorry, people from the rest of the world. This is extremely well-written, @Vega! You've made sense of it for me, and this will be a great addition to the wiki. @Vega color is good. I'd rather keep everything consistent with US spelling where possible. Especially as that's the name of the type. Finally got it added to the Wiki in the tutorials section just below the tutorial on vec2. Not sure if that is the best place, feel free to move it if you like. Thank you very much, Vega. I finally can try to mess with mesh. Great tutorial, @vega. Suggestion: please add screenshot for every given example. That way, the learners would know whether his/her code is correct or not. Thank you. Looking forward for the advance chapters. That is a little slow however, because you are clearing and recreating the mesh each time you add a triangle. 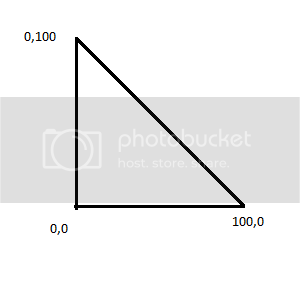 Not sure a function to create a triangle would actually be all that useful. For a rect it's great, because you only need to specify x, y, w, and h, but there's really no getting around the fact that you need to specify 3 points for a triangle. @Vega we thought about it, but as @toadkick mentioned, you would need up to 9 arguments to specify the triangle's vertices. I felt that this was more neatly done over multiple lines. In addition, you would not be able to use addTriangle and addRect reliably together - as addTriangle would break the returned rect indices. Still I agree in principle that there needs to be a better way to add triangles. Thank you @Vega for a very helpful guide. I am correct to understand, however, it is more akin to a function (m:vertices(vertexTable)), because to change the vertices you cannot simply update the table referenced (in my example) by vertexTable)? Maybe I should take the time to look at the API to see how it really works. but it would need more code to avoid changes to the table forever affecting the mesh userdata that it has now become associated with. @mpilgrem: that's what I figured, and it makes sense. table.insert() won't work because under the hood I'm sure that mesh just uses a straightforward memory buffer (don't have the code in front of me at the moment, but I'll bet it's a std::vector). It might be cool to have an addVertex() method to tack on a vertex to the end of the existing buffer, and/or an insertVertex() method that would shift higher indexed vertices up (though that would be a bit expensive). Dunno, I'll have to think about it some more. Not sure that there are enough common use cases to warrant the API additions. Continuing my experiments in how Lua can be used to rewire built-in functionality, the following code rewires rawset, table.insert and the mesh userdata to make m.vertices = vertexTable behave like its syntax implies - linking the table with the mesh userdata. -- Is the table linked to meshes? -- Is a vertex table linked to mesh? @mpilgrem from a glance at the code, that will clear the mesh every time the vertex table is modified? I think it's a great piece of code — especially if you use it to set up a fairly static mesh. But for dynamic meshes you might not want to do that (if they get large). @Simeon, you're absolutely right, of course. I should have made clear that - currently - extending a general mesh userdata's vertices, once they have been set initially, will involve an inefficient 'reset', no matter what syntactic approach is adopted. I was experimenting with syntax, really - rather than proposing something useful for dynamic situations. Looks interesting. What you could do is have a flag that is set when you modify the table, and alter mesh's draw function to copy the vertices over and reset the flag before drawing. I have added this page to the wiki. My aim was to provide reference-type material to complement @Vega's tutorial, and add to what is set out in the in-app reference. Good info there, @mpilgrem. I wish I had that when I was learning about Meshes. Nice work @Vega and @mpilgrem. Learning is getting easier with everyone's help. (added this update in case anyone thought the page had been deleted as the link above doesn't work).